Bitcoin Poker - A quick guide. 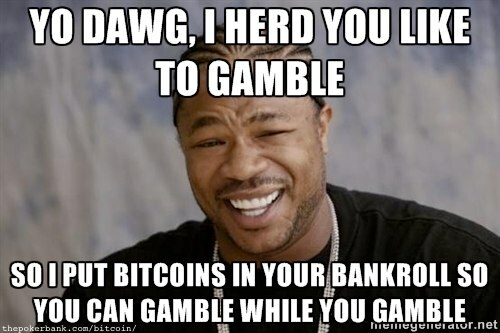 You're a poker player, and you are interested in playing with bitcoins. If that's you, read the whole page. Don't worry, it's a good read. Or Reason 3: you don't know why you're here, but this page looks interesting anyway. I'll try and explain everything as best as I can on one page. Note: This isn't for everyone. Please read the entire page (and preferably other links) before playing poker with bitcoins. This is new, so don't just take my word for it. These were created in 2009 by Satoshi Nakamoto as an alternative to the usual fiat currencies -- borne out of frustration that a small minority of people in power were able to create a financial crisis that affected the majority. Since 2009, Bitcoin has been rapidly gaining popularity and growing in value. You can buy bitcoins using the currency you're currently using. Just as you can buy GBP using your USD, you can also buy BTC using USD (or whatever currency you like). They're all forms of currency and can be bought, spent and traded. You can then use these bitcoins to play poker on sites that accept them. So instead of depositing $100 and playing in Dollars, you deposit $100 and get the equivalent in poker room chips (where 1,000 chips = 1 BTC at SealsWithClubs). Eventually you convert your winnings from BTC back in to USD (or whatever your "home" currency is). And yes, it is a lot easier than you expected. All you have to do is buy a few. It's one small step between you and playing poker freely. 3. How do I buy bitcoins? Coinbase.com - A quick and easy Bitcoin exchange for US buyers. LocalBitcoins.com - My personal favourite. People list the prices they're selling them for and via whichever payment method they accept. Then you offer to buy them and make the transfer. When they see the money has come through, they release the bitcoins from escrow. They are all easy enough to use. It took me about 15 minutes before I bought my first load, and 10 minutes of that was spent browsing around to see what's going on (sometimes I like to see what other people are doing first). 4. Why play poker with bitcoins? Why not just play with straight-up currency like USD? Why add another layer of complexity by using USD to buy BTC to play poker with? US Poker - You can easily play online poker in the US with bitcoins. The US government tries to make it difficult for online poker rooms to process gambling transactions, which makes the whole US online poker thing a bit of a grey area. Bitcoin circumvents this problem. Unique Player Pool - Bitcoins are new and so are used by a certain demographic of people. The vast majority do not have bitcoins because they're good at poker, so when they do decide to play some poker with them they make juicy targets. Fast Withdrawals - Get your money in and out of the poker rooms the same day, usually within a few minutes. Bitcoins have been designed to be sent and received quickly. Less transaction hassle. Lower Rake. Because these poker rooms do not have to deal with payment processing and all the costs associated with it, they can afford to charge less rake. Bitcoin sites charge 2.0-2.5%, fiat currency sites charge 4.0-5.0%. The unique player pool is the biggest incentive for me. I personally believe it's an area to exploit, just as the first good poker players exploited the influx of fish in to online poker after Chris Moneymaker won the WSOP in 2003 (see "Moneymaker Effect"). Also, many people across the Internet have a strong belief in the utility of and positive future for bitcoins. If you learn about them for yourself and decide you feel the same way, having a few bitcoins in your pocket may turn out to be useful. What else can I do with bitcoins? In fairness, not a lot. You can buy stuff from Overstock.com, Scan.co.uk, and a bunch of other places, but you can't use them everywhere just yet. They're not mainstream enough to be able to pay your bills or buy sandwiches with. Most people buying them are trading, investing, or buying items anonymously. The plan is that as the currency picks up more and more traction, more and more services will be forced to accept BTC as a form of payment. Right now it's a fledgling currency that's mostly utilised in "alternative" markets (if you know what I mean). 5. What are Bitcoin poker sites like? Basic, but they work. Traffic is low (<500 online players at one time), but there's enough to play poker at the most popular limits. You'll have no problem getting a game anywhere between the equivalent of $2NL to $400NL, although as you'd expect $50NL and below gets the most action. Basic software for now, but it works. A screenshot of the SealsWithClubs lobby at 20:00 GMT on 15 Nov 2013. Take note of the "Players" column. Again, bitcoins are new so it's not like everyone has them or knows how to get them. I'm confident that this will change in time, but right now it's only a certain type of person who owns some. Remember what poker rooms were like back in 2006? Yeah, well these Bitcoin sites are a bit (heh) like that. These are relatively new start-ups, so they have limited experience in the software development department. They have a good service to offer and they're giving it a go with what they've got. Overall the software isn't an issue - the poker works and you've just about got all the features you need to make it playable. In fact, I kinda like the bare-bones approach to playing poker online. It's the nostalgia, and because simple and effective is always cool. The thing to remember is: you're not playing Bitcoin poker because the poker room has lovely software. You have more important reasons, so you're thankful that the platform is there and working. Glad you asked. There area number of significant risks to playing poker with bitcoins. It's not because the currency is inherently bad, but because it's completely new territory. It could be the start of something incredible, or the the middle of a bubble that's about to burst. Bitcoin prices are volatile. You could be killing it at the poker tables, but if BTC crashes your "winnings" could turn out to be a net loss after converting back in to your home currency. It may fail. This is a new idea. It's an idea that I love, but it's basically a worldwide experiment. It's a new idea. Who knows what might be around the corner for bitcoins. It could be awesome, or it could be bad. That's what makes it exciting - we don't know how it's going to work out. Be a smart person. Do your own research and come to your own conclusions. Don't let anyone tell you what you should or shouldn't do with the money you've worked hard to earn. You're a poker player for a reason, and it's because you know how to adequately asses risk. I love the concept of a decentralised currency. I want Bitcoin to do well, so I'm getting involved. I think I'm exploiting a temporary opportunity by playing poker against people who have bitcoins too. I'm playing with an amount of money I can afford to lose. You may be in a different situation and/or feel differently about the future of Bitcoin. Only buy bitcoins if you believe in the concept. If you don't think they have a future, you'd be a fool to hold them. I hate to say it, but this is as close as you're going to get to gambling whilst you're gambling, so make sure you're happy with both bets you're making. This is the most important section of this article. This list of links isn't exhaustive, but it's a collection of things that I found most helpful. If you understand something, you can see the gaps more clearly. Bitcoin.org - Start here. It's nice and basic. BitcoinTalk.org - The biggest forum. BitcoinWisdom.com - My favourite site for looking at charts. I know a lot of people prefer Bitcoinity.org though for its simplicity. Bitcoin Lecture Videos (Udemy.com) - A thorough course of videos on everything you need to know about Bitcoin. The videos are lengthy and feel slow at points, but all the information is there. SealsWithClubs TwoPlusTwo thread - 400+ pages documenting the development of the first major Bitcoin site through questions and discussions amongst active online poker players. A bitcoin casino. Works well. I like how easy it is to move your winnings around.